It says everything about the anguish in Aston Villa manager Steve Bruce's life that the tension and pressure of a Championship play-off semi-final was a welcome break from the pain caused by the death of both his parents. It has been a traumatic year for Bruce, whose mother Sheenagh died last week, just 88 days after his father Joe passed away, but he was adamant he had not lost any of his focus in the build-up to this season-defining encounter. 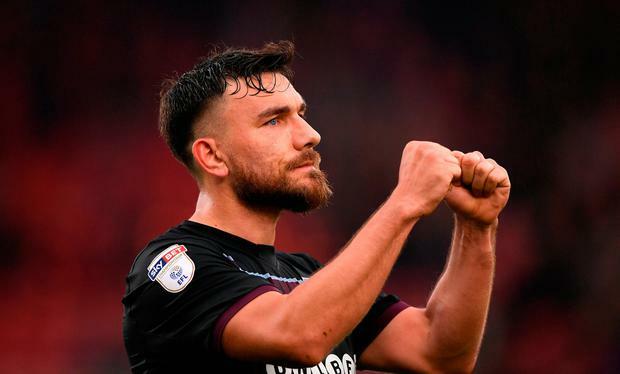 Not everyone will have been convinced about that, given the obvious toll it has taken on him, yet his players - in and out of form all season - delivered when he needed it most, securing a slender but crucial advantage heading into the home leg on Tuesday night thanks to Mile Jedinak's header. No manager has been promoted to the Premier League more times than Bruce and there was a touch of class in Villa's display, neutralising a Middlesbrough team which had run out of ideas concerning how to try and pierce their backline long before the final whistle blew. The sides looked evenly matched on paper but it was in the mind where Villa showed the greater strength. Boro, in front of their own supporters, were tense and frenetic. The occasion got the better of them in the first half. Everything was rushed and hurried, their decision-making scrambled. In short, there was a lack of clarity in their performance and although they improved as the half wore on, they were chasing the game having fallen behind. For those in red, emotion had got the better of intellect, but Villa's players were different. They were composed and far more clinical in everything they did. There was something about the way the visitors held themselves, striding around the pitch, confident, assured. They were not going to be unsettled by anything, either on the pitch or in the stands. The partisan atmosphere focused their minds rather than unnerved them. They exuded experience. Boro may have had the first chance, a long-range shot from Muhamed Besic which had goalkeeper Sam Johnstone, on loan from Manchester United, looking nervously over his shoulder as it dipped narrowly over the bar. 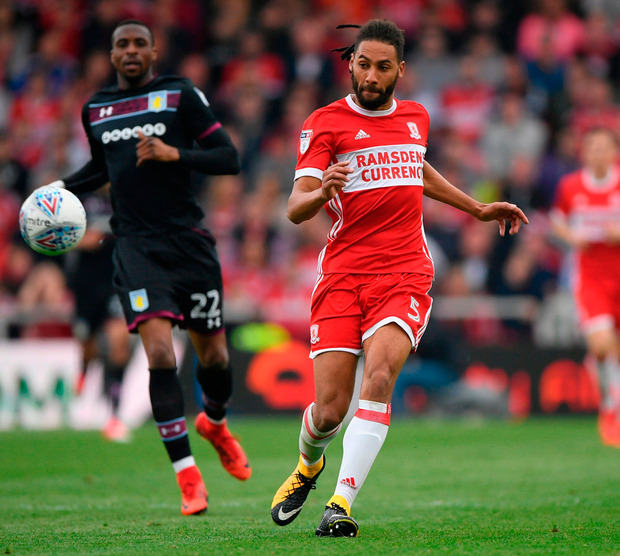 But Villa were settled and slick, snuffing out Boro's main creative force, Adama Traore, as they frustrated and then thrust, taking the lead with a brilliantly worked set-piece. 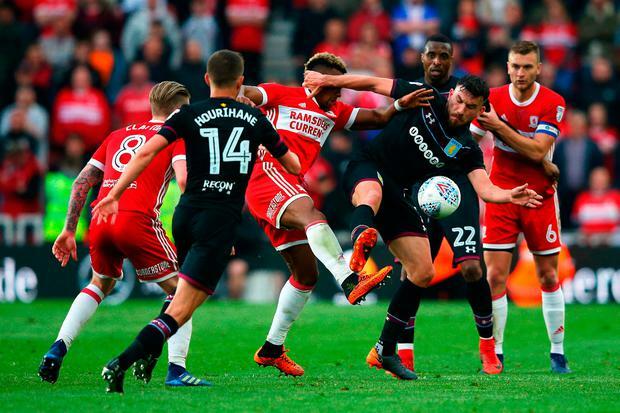 Lewis Grabban was the decoy, pulling Ben Gibson away from the back post when Jack Grealish swung in the corner to the near one. Gibson fell for it, following Grabban, so when Jedinak sent a glancing header goalwards there was nobody on the line to clear it. First blood to Bruce in the tactical battle and Villa could well have doubled their lead before the break as only a great save from Darren Randolph, tipping the ball on to the post, kept out Robert Snodgrass's curling effort. 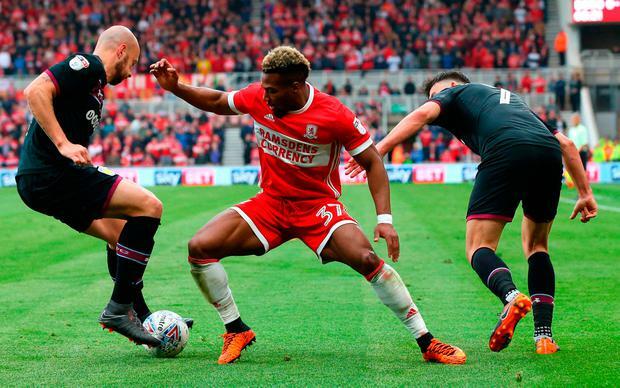 Boro had only won one game against a top-six team this season and although they began to offer a threat of their own going forward, they wasted the half-chances that came their way. The best of them fell to Britt Assombalonga, whose header, from six yards out after a Traore cross, was straight at Johnstone. The former Nottingham Forest striker also blazed high and wide after taking an excellent pass from Jonny Howson down on his chest. It summed up his team's first 45 minutes, as with a little more composure he would have at least hit the target. The only other real cause for excitement for the home supporters was when the Villa defender Alan Hutton almost headed a corner into his own net. The problem for Tony Pulis, the Boro manager, was that he did not want to chase too hard. Whatever the result after 90 minutes, it was only half-time in the contest. He will be well aware of the fact that Villa's players have sometimes struggled with the weight of expectation in front of their own fans. If anything, Boro were more methodical after half-time, more patient, but they struggled to break Villa's backline. At the age of 37, John Terry no longer moves like he once did, but he can still organise a rearguard action and Johnstone did not have a save to make until eight minutes to go when he tipped away a header from his own player, substitute Birkir Bjarnason.